The controversies over how (and whether) Great Britain should celebrate the recent centenary of the Balfour Declaration were revealing. Anglo-Israel relations have rarely been uncomplicated, but they could soon be much worse. There are those who carry the quest for yichus to extremes; Steven Weitzman is not among them. Romain Gary—a Lithuanian Jew who regarded himself a Frenchman par excellence—emerges in a recent memoir as a master of self-invention and (just as immoderate) verbal invention, a chameleon of pseudonyms, a man of irreconcilable contradictions, divided against himself. At their inception, the children’s house and collective education were to shape a new kind of emotionally healthy person unfettered by the crippling bonds of the traditional or bourgeois Jewish family. Over the last two decades or so, a cultural backlash has set in among some of those raised in children’s houses. 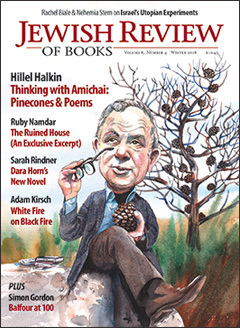 In their respective new books, Schama and Feiner attempt not to relate the whole history of the Jews during the period covered by their volumes but to tell their story—indeed, to a large extent, to let them tell their story in their own words, culled from their letters, diaries, and autobiographical works. Abraham Socher's pre-Yom Kippur assessment of the possibility of true repentance led to a discussion on the mussarist's answer (or non-answer) on moral choices.